Senior night: an event to honor all the accomplishments, dedication, and hard work of the graduating class over the last four years. On Sept. 25, Northside celebrated Caroline Merck (Adv. 901), Abigail Smith (Adv. 902), Esther Huescas (Adv. 911), Kimberly Grabiec (Adv. 902), Emilia Chojnacki (Adv. 904), Melissa Suarez (Adv. 906), and Elizabeth McGovern (Adv. 911) for their outstanding high school volleyball careers. Per Northside tradition, the juniors and underclassmen picked a theme for senior day. This year, the team chose Snow White and the Seven Dwarves, in which each senior was a dwarf and their coach was Snow White. The seniors discovered the theme during the first festivity of the day, a breakfast potluck. Afterwards, each senior went to her locker to find it personally decorated. The seniors were also given other gifts throughout the day, and every volleyball player wore a Snow White and the Seven Dwarves senior day shirt with the seniors’ name and character on it. Immediately preceding the senior night game versus Lane Tech, each senior was presented a speech by a non-senior on the team whom they had a special bond with. The speeches were heartfelt and emotional. During the speeches, each senior was called up with their parents and pictures were taken. 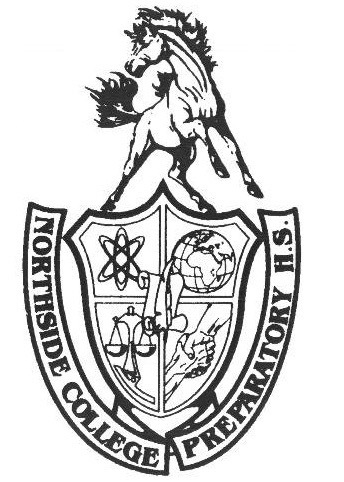 Once the actual match started, Northside played two challenging games, but did not emerge victorious. Lane Tech won the first game 25-6, and won the second game 25-13. Regardless of the score, Northside’s girls, especially the seniors, had some great plays and encouraged each other tremendously. The crowd cheered loudly, had handmade posters made for the seniors, and greeted them warmly after the match. In regard to the season as a whole, senior and captain Merck says, “This year has been rocky. Although we have had some great matches against some of the toughest teams in the city, we don’t always come out on top.” The Mustangs, however, still have matches to play against Lake Forest Academy and Chicago High School for Agricultural Sciences. The team also has city and state playoffs to look forward to. Merck says, “I hope that I have left my mark on Northside College Prep Volleyball in the best way possible. Previous captains such as Audrey Konow, Isabelle Banez, and my sister, Kathryn Merck, have been such huge volleyball role models for me on and off the court, and I hope I have filled their shoes this year so that the junior class can take over and continue the volleyball legacy.” This year’s seniors have definitely left their mark on Northside’s volleyball team and will truly be missed.